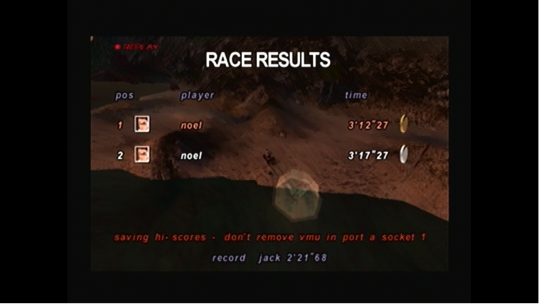 Get the fastest time on the Maui Easy Time Trial course. You may submit as many entries as you like for 14 days when the competition will close. See the website for the exact date and time. Not terrible for my first time picking up the game. It took me a while to figure out how the releasing of the parachute worked, but alright. lastcallgames wrote: It took me a while to figure out how the releasing of the parachute worked, but alright. I had the exact same problem when I first played the game! 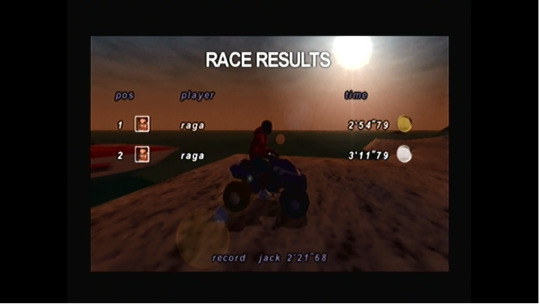 I kept landing out of bounds and ending the race. The first few times I'd try to press A while too high up, and I thought it was just a buggy poorly done Infograms game, nope, I was just about to die if I'd released. C'mon people! Let's see those entries! I've extended the competition another week. We need more than two entries! Don't you people like Dreamcast games?! I guess we can count this as a totally new entry, if we really want to. I think people just don't want to play crummy Infograms games. lastcallgames wrote: I think people just don't want to play crummy Infograms games. Well people voted for it! Infogrames is just the publisher. It was developed by a company called Inerloop Studios. Looks like this is the only console game they ever developed. All the rest were for PC. I think it's quite fun though. It was given some pretty good scores by reviewers back in the day as well. I feel this is a good time to point out I usually just vote for whichever game I have. I'm part of the problem. Also I was the leader for like 6 hours!